LockCon: tired but very satisfied! You are used to me publishing something on this weblog every sunday (or when I am busy on Monday). Well … don’t worry, I will keep that up. But las weekend was a true demolition derby, and on sunday I was fully wrecked, I just could not write sooner. And I am still recovering (and very busy with my daytime job as I will fly to Dubai on Friday for a trade show). First of all I would like to thank all that attended and helped out at LockCon! As always it was quite the experience and we did mange to make it the best Sneek event ever. And I am already wondering what we can offer next year…. 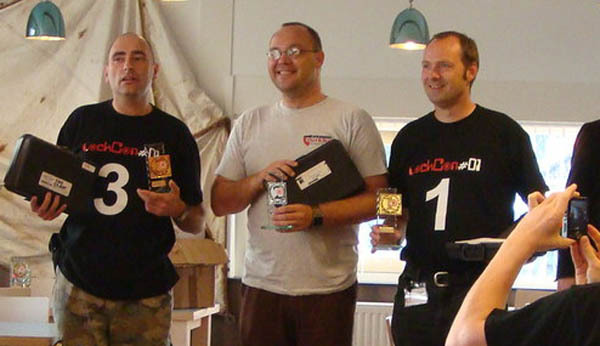 For me the ultimate LockCon experience was the impressioning championships on Saturday evening. 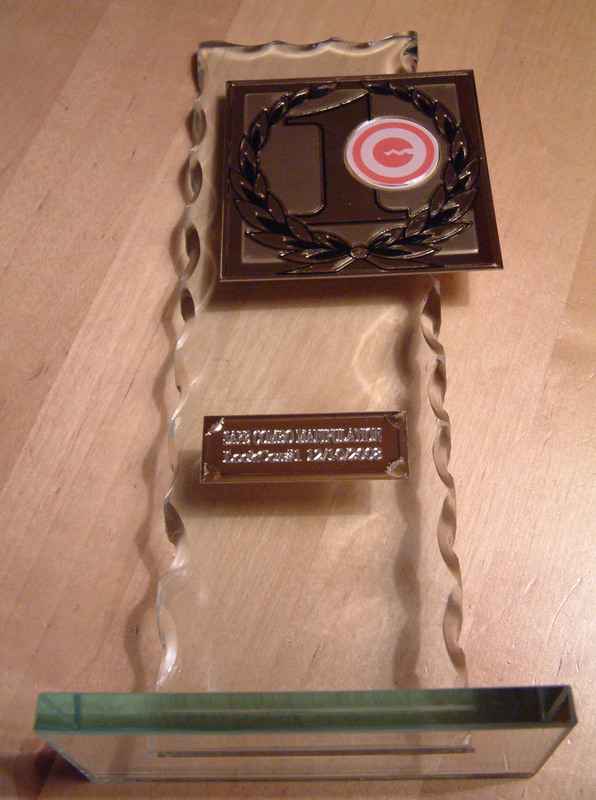 You might remember six weeks ago I finally managed to become ‘Meister’ at the German games in Cologne. And now my German friends were out for revenge (in a very sporty manner). 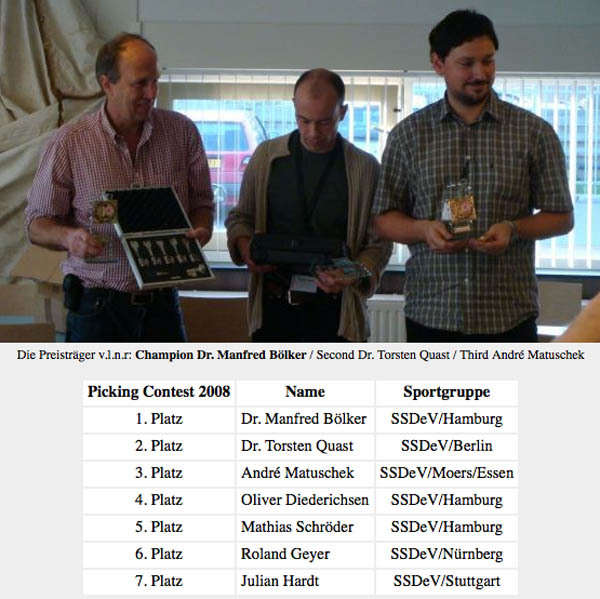 SSDeV president Steffen WernÃƒÂ©ry prepared packages filled with fifty blanks and practice locks, and send them out to the members that could help stop the Dutch invasion. The message to the members was clear: bring back the title to Germany! 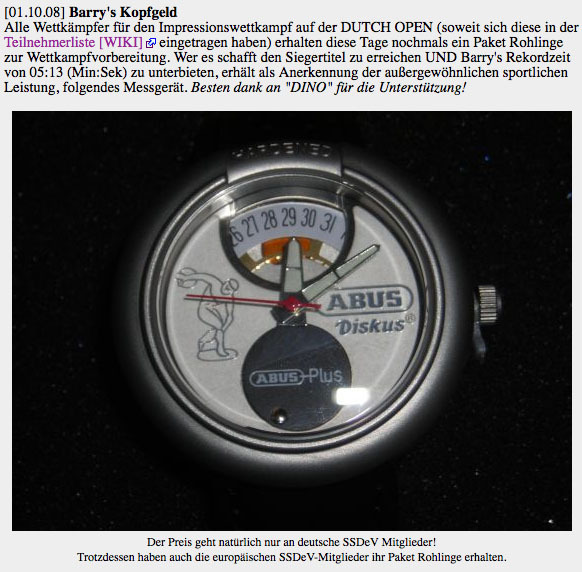 On top of that he offered the SSDeV member that would beat me and my record time (5:13 minutes) a rare and beautiful watch made by Abus in the shape of a discus lock. All this caused the games in Sneek to be the one with most participants ever (around 35?). And all the big names were there trying to win the title and watch. As I wrote before, I did not lose any sleep over all this. The sleep I lost was about the many other worries as the event needed my full attention to bring it to a happy end. So I did not get a chance to practice impressioning at all and just had to rely on my basic skills. The only thing I could do was arrange an hour orso in private just before the games to do some sort of warming up (opening a few locks). And I apologize for being selfish and just write about the impressioning games for now. I will soon try to write a follow up on the unforgettable LockCon event, and report about the many presentation and Dutch Open lockpick games (Medeco locks in the finals). 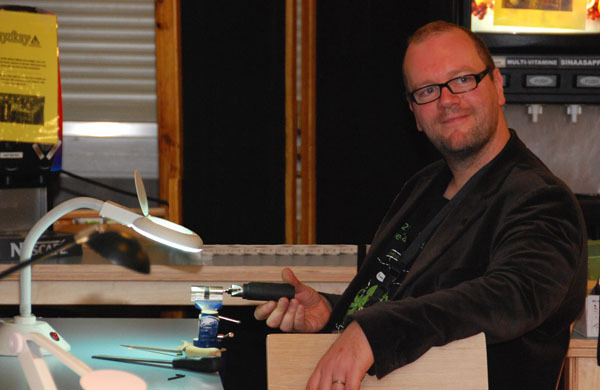 And Steffen WernÃƒÂ©ry shot some spectacular video of the impressioning games. It will take him some time to edit it, but I am looking very forward to seeing and sharing it …. But for now I just need to catch up lots of sleep …. Not losing any sleep ehrm ?!? The worst one that gives me a small headache: the privileges we used to have at the hostel are melting away. A new and more expensive building, and new management that does not know us make life a little difficult. But we will all do our best to make the best of it. Entries (RSS) and Comments (RSS). 43 queries. 0.323 seconds.